1. Set a plastic bowl outside while it’s snowing and collect a bowl of clean snow. If you know a storm is coming, set your bowl out the night before. If all else fails, scrape the top layer of snow off the fence or the car. 2. Have on hand a can of evaporated milk, sugar and vanilla. 3. Bring in your bowl full of snow and add your ingredients. 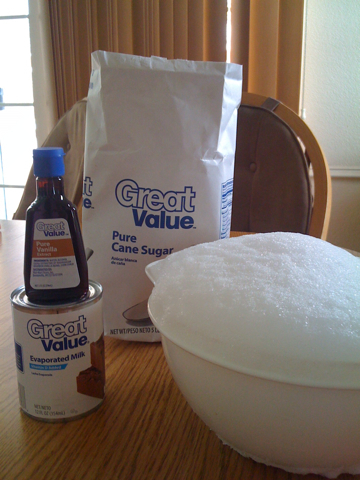 For a bowl that holds 12 cups of snow we use almost a can of milk, 1/3 cup of sugar and a teaspoon of vanilla. 4. Serve in a fancy dish. Eat with a spoon or straw. Mmmmm. Thanks to Auntie Molly for teaching us how to make snow cream! 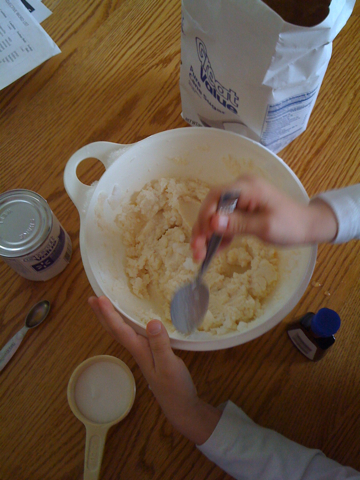 This entry was posted in kids, unplugged and tagged snow cream, snow day. Bookmark the permalink. Good work!! You made Auntie Molly very happy. Thanks to Auntie Molly, we were very happy!